Description: Designed with a curved profile and a clean architectural look, this appealing and versatile ceiling fixture reveals a sophisticated aesthetic. 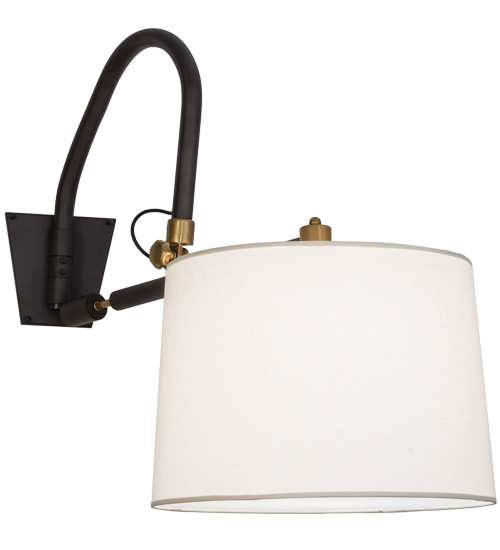 An Eggshell Textrene shade is complemented with Black finished hardware and a swing arm that adjusts left and right and pivots up and down, which are enhanced with Oil Rubbed Bronze Flat Satin Brass accents. Handcrafted by highly skilled artisans in our 180,000 square foot manufacturing facility in Yorkville, New York. Available in a wide range of custom choices including various designs, colors, sizes and dimmable energy efficient lamping options such as LED. The Stuyvesant sconce is UL and cUL listed for damp and dry locations.